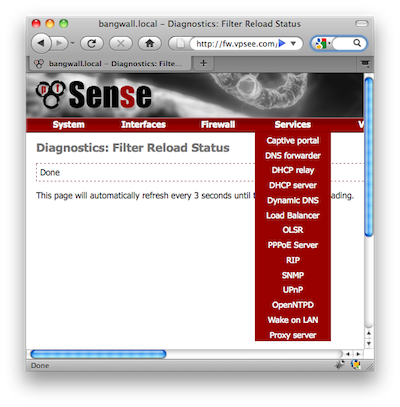 Only works if pfSense is the public IP assigned to one of its interfaces. If you have a modem that gets your public IP and pfSense is a private IP, private IP address is registered with the provider. Can't load '/usr/local/lib/perl5/site_perl/5.8.8/mach/auto/Net/SSLeay/SSLeay.so' for module Net::SSLeay: Shared object "libssl.so.4" not found, required by "SSLeay.so" at /usr/local/lib/perl5/5.8.8/mach/DynaLoader.pm line 230. Compilation failed in require at /usr/local/lib/perl5/site_perl/5.8.8/IO/Socket/SSL.pm line 17. BEGIN failed--compilation aborted at /usr/local/lib/perl5/site_perl/5.8.8/IO/Socket/SSL.pm line 17. Compilation failed in require at /usr/local/sbin/ddclient line 1652. 安装完 squid 后根据需要做一下配置，值得注意的是，默认安装后只有和这台 firewall/squid 服务器在同一个网段的机器才能通过这个 squid 访问 Internet，如果其他网段的电脑也想使用这个代理服务器的话除了在 Firewall: Rules 增加规则外，还需要在 Services->Proxy server: Access control 中增加网段到 Allowed subnets.